Being Active is designed to get kids and families moving. With the obesity rate at an all time high, this book and literacy guide give families many ideas on how to get and stay active. The literacy guide also provides good information for helping to maintain an active lifestyle, discusses the importance of being fit, and gives many suggestions on how to make fitness a part of everyday life. 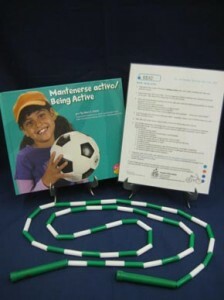 Activity: jump rope with many suggested activities.